LONDON - An announcement from FIFA secretary general Jerome Valcke that the 2022 World Cup in Qatar would not be played in the summer created yet more controversy around the finals on Wednesday. It led to a shocked response from FIFA vice president Jim Boyce who said that only the world governing body's executive committee could decide when the World Cup would be played. In a later statement, FIFA backtracked on Valcke's comments which came in an interview with radio station France Inter. Valcke said: "The dates of the World Cup will not be in June or July. I think it will be played between November 15 and January 15 at the latest. "If you play between November 15 and, let's say, the end of December, it's the time when the weather is the most favorable. "You play with a temperature equivalent to that of a rather hot spring in Europe, you play with a temperature of 25 degrees (Celsius), which is perfect to play football," he added. The average temperature in the summer months in Qatar can be around 35C (95 Fahrenheit) and 45C (113F). In a subsequent statement FIFA appeared to backtrack saying Valcke was giving "his view" that the 2022 World Cup must take place in winter and the best time would be November 15 to January 15. The FIFA statement added: "The precise event date is still subject to an ongoing consultation process which involves all main event stakeholders, including both the international football community (FIFA, confederations, member associations, leagues, clubs, players) as well as FIFA's commercial partners (Commercial Affiliates and Media Rights Licensees). "Consequently, no decision will be taken before the upcoming World Cup Brazil as agreed by the FIFA Executive Committee." FIFA VP Boyce of Northern Ireland told Sky Sports News he was very surprised by the timing of Valcke's announcement. "I am totally shocked to be honest," said Boyce. "The situation, as far as I'm aware, is that the FIFA executive committee was awaiting a report set up by all the stakeholders involved in the World Cup - television companies, leagues, sponsors - meeting between now and the World Cup in Brazil. 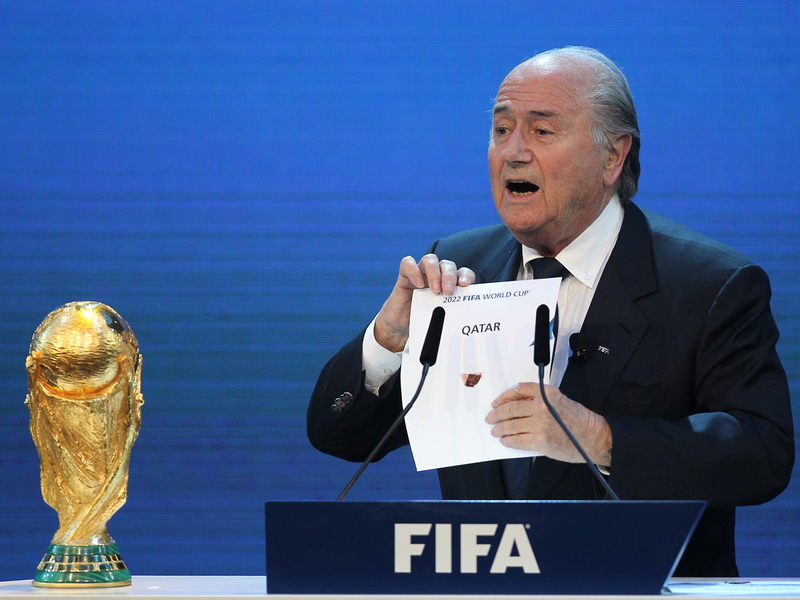 "The plan was that there would be no further discussion on the World Cup in Qatar until December at the end of this year. "Whether Jerome was making a personal opinion or not I just don't know, but I can confirm this has not been discussed by the FIFA executive committee. I am very surprised about what has happened this morning. "100 per cent I can confirm that the FIFA executive committee has not decided to move the World Cup. "The decision would not be taken until the end of 2014, or at the March 2015 meeting of the executive committee." After hearing Valcke's pronouncement, Philippe Piat, the president of FIFPro, the international players union, told Reuters: "It is excellent news, we have been asking for that for months." Asked if he was surprised by the timing of the announcement, he said: "Yes and no because the decision was supposed to be made last October but it had been postponed because the clubs and the leagues had asked for a delay." FIFA delayed its decision in October saying it was setting up a consultation process to decide when to stage the finals. At the time, FIFA president Sepp Blatter said it would reach a conclusion sometime after this year's World Cup in Brazil. "The stakeholders include the players, the clubs, the leagues, the national federations, the confederations and FIFA, but it doesn't only include sports," he said. "There are other partners, economic ones, be they from marketing, the media or television. "We also need to bear in mind our obligations towards these partners, so we need to carry out very deep consultation and pay a great detail of attention and show some diplomacy and wisdom." Valcke's surprise announcement on Wednesday comes more than three years after Qatar was originally awarded the tournament in December 2010. Qatar won the hosting rights ahead of Australia, Japan, South Korea and the United States, eventually succeeding in the fourth round of voting by 14-8 ahead of the U.S. Although it would not be a surprise if the finals are held in the winter months, it would mean a massive disruption to the global soccer calendar and also affect other sports. Controversy has surrounded the decision to give Qatar the finals since the day it was made and clearly shows no signs of abating even with the tournament more than eight years away.